Craving for some peace and solitude? Then Shivagange, is the place for you. It is just 60 kilometers from Bangalore. This hill which is 1368 meters high offers complete rejuvenation of mind and body with its ancient cave temples and steady trek right to the hill top with man made steps and railings for support. At the top you are guaranteed breathtaking panoramic views of the entire surroundings. The specialty of this Shiva temple is that offerings of ghee turns to butter when applied on the Shiva Lingam (idol). The same butter is served as prasadam to the devotees. This temple was patronised by Kempe Gowda, the founder and architect of Bangalore. And you can find the bronze statue of Kempe Gowda along with ancient idols of Fire God, Sun, Dancing Ganapati etc,. inside this cave like temple. 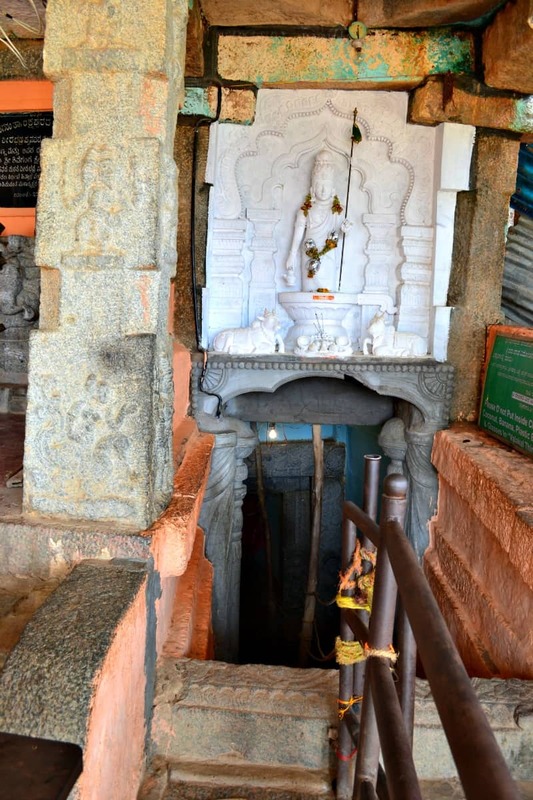 There is also a tunnel inside the temple which is said to connect to the heart of Bangalore. This place is 60 kilometers from Bangalore, near Dobbasapete, Tumkur. You will get plenty of KSRTC buses from Majestic bus stand to Dobbasapete. From there Shivagange is 9 kilometers for which you can avail private buses or autos. If you are driving take the NH-4 Bangalore-Tumkur road and drive towards Dobbasapete. After Dobbasapete take a left and drive to Shivagange. The journey takes around two hours from Bangalore. Shivagange does not boast of many good eateries. There are Kamat outlets on Tumkur road for food. It is best to pack your lunch from the hotels if you plan to spend some time in Shivagange. When you go higher up the hills, you can find Olakala Teertha which is an underground spring. It is a popular belief that if you can touch the water , it is proof that you are without sins. At the peak of Shivagange lies the Nandi statue which is a large monolith carved out of a single stone. It is said that if you take three rounds around the Nandi you are freed of all your sins. But it is a mission impossible task as the steps are steep and the view below, a precipitous one. Fantastic and panoramic view is guaranteed at this spot. It is said that queen Shantala, wife of Hoysala King Vishnuvardhana jumped from this 500 feet point and ended her life. Shantala devi was a beautiful queen well versed in dance and music. But when she failed to produce an heir to the king she jumped off the cliff. For more details about her poignant story, check out books by K V Iyer on Shantala. While trekking you can find plenty of natural springs like AntharGanga, Patala Ganga, various Nandi statues, life size idols of Lord Shiva and Parvati and a holy water pole wherein water springs out only on Jan14th (Makara Sankranthi festival). With steps carved out of rocks and railings on either side the trek is not an impossible one. The breeze that accompanies you as you climb higher, makes the climb less strenuous. Don’t miss it if you wish to see the spectacular view with changing landscapes, rivers and hills from the hilltop. The best time to visit this place is during winter or summer months. During rainy season, the rocks tend to be slippery. Beware of monkeys while trekking. Carry a stick with you to scare them away. The trek up the hill to see the Nandi may take around 4.5 kilometers or so. So carry light snacks and water with you. There are also shops selling cucumber, pineapple, buttermilk, mango, water and other light snacks up the hill. After Olakala Teertha, the trek becomes steep and so the climb is not advisable for children below seven and elderly people. Steps are carved in rocks and steel bars guide you. Usha is a resident of R.T Nagar and a travel enthusiast. Government schools are being merged. But children are trickling out of schooling in the process. Trekking up the hills of Lav-Kusha hill at Mulbagilu, you encounter solitude, while the age old temples adds to the peace and tranquility of the place. No one was ready to fund this film, but Pawan Kumar did not stop. Now, Kannada’s first crowd-funded film Lucia, directed by ‘Laifu Ishtene’ fame Pawan Kumar, has won the prestigious Audience Award in London Indian Film Festival.